Here’s a clever approach that Michel Richard published in his cookbook “Happy in the Kitchen” : asparagus spears paired with an asparagus “vinaigrette.” If you love green vegetables, as I do, you will delight in this recipe. It’s a model of simplicity because it involves so few ingredients, but you must pay attention to the details, and above all, avoid overcooking the spears. I can’t imagine a better way to welcome Spring! Set aside 4 whole spears for the dressing. Cut off the tough bottom ends of all asparagus spears and set those aside for the as well. With a vegetable peeler, peel the remaining asparagus starting about one inch below the tip. Have a bowl with ice cold water ready. Steam the asparagus spears for 5 to 6 minutes only, until they are just tender when gently pierced with the tip of a knife. knife. When the asparagus is cooked, lift the spears with a pair of tongs and plunge them in the ice bath to cool, then remove and dry on kitchen paper or a towel. Make the asparagus sauce: cut the 4 reserved spears into 1-inch pieces. Place them in a small saucepan with the trimmed asparagus bottoms and add ¼ cup water and the olive oil. Bring it to a simmer, cover, and gently cook for 8 to 10 minutes, or until the asparagus is completely softened. The water should have evaporated, leaving the asparagus stewing in only the oil. 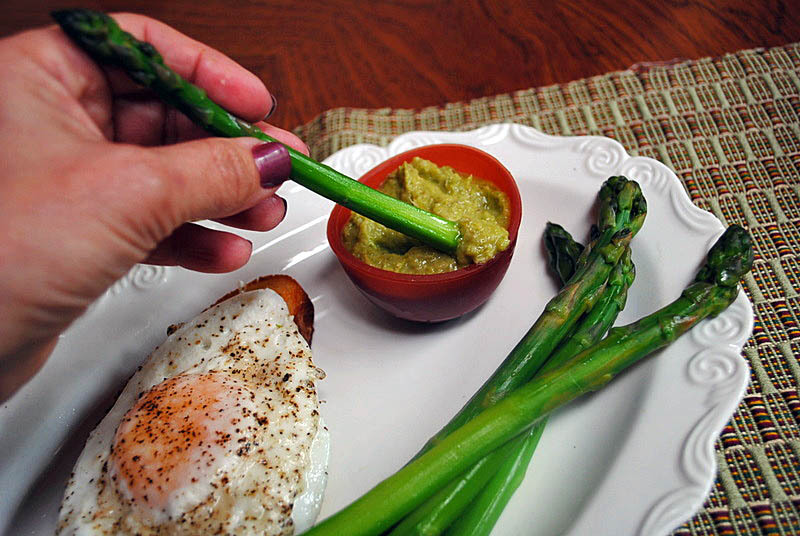 Transfer the asparagus to a blender or food processor and puree it until completely smooth. Transfer the puree to a small bowl and whisk in the mustard, lemon juice, salt, and pepper. 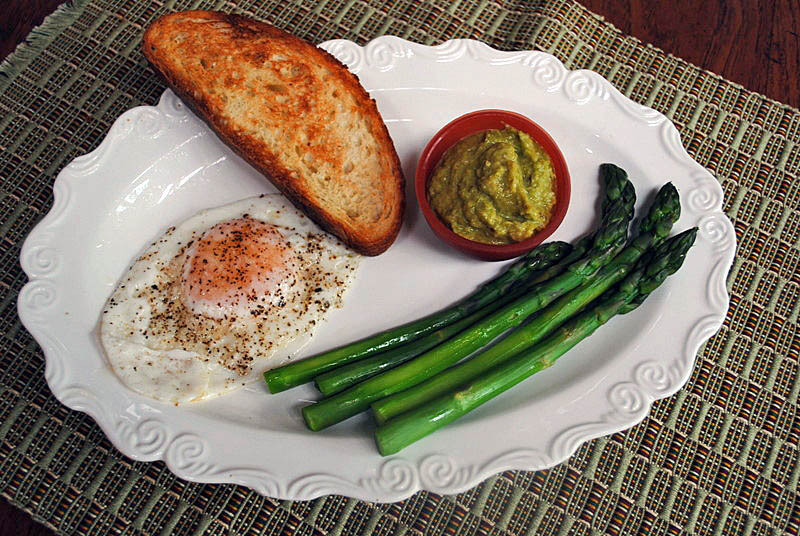 Serve the asparagus on a platter, with the vinaigrette in a small dish or ramekin on the side for dipping or dousing the spears. Comments: Peeling the asparagus may seem like work, but don’t skip it. Use large asparagus for this dish, and the peeling will ensure a wonderful texture and even cooking. I enjoyed them as a light lunch with homemade bread and a sunny-side egg, but the dish is also a perfect option as an appetizer at a dinner party. The asparagus lovers among your guests will never forget it! The sauce or dressing is an excellent adaptation for the tough ends of the spears, so consider making some whenever you cook asparagus. I imagine that it will also complement other dishes, like grilled salmon, with a sprinkle of fresh dill on top. Must try that soon. The beginning of asparagus season always makes us happy!